TAMPA, FL--(Marketwire - March 4, 2011) - Experience the ultimate in relaxation and escape to Tampa, FL, where spa deals make it easy to create a rejuvenating interlude at a premier downtown Tampa hotel overlooking Tampa Bay in the popular Channelside District. Stroll along the bay, take advantage of the local arts, shopping and entertainment or just stay in, with the Spa Escape for Two at the Tampa Marriott Waterside Hotel & Marina where guests booking this Tampa weekend getaway deal will be greeted with complimentary valet parking before adjourning to their accommodations which include a spacious room with a king or two double beds, room-service breakfast for two and a late 2 p.m. checkout. Breakfast is served through room service from 6 to 11:30 a.m. or at the Tampa hotel's Cafe Waterside from 6:30 to 11:30 a.m. An easy choice for a romantic getaway, rates for this deal start at just $305* and are available only through April 30, 2011. Guests enjoying the Spa Escape for Two Package may choose from two unique spa service offerings. First is the Deluxe Spa Package which includes a 25-minute massage, express facial, or pedicure. The second option is the Tampa hotel's Luxury Spa Package which includes a 50-minute massage, deep-cleaning custom facial, or manicure and pedicure. Regardless of their selection, guests are in store for a refreshing, relaxing experience that they will not soon forget. The Tampa Marriott Waterside Hotel is a popular choice among wedding venues in Tampa, FL, featuring elegant ballrooms, a pristine waterfront patio and the services of certified Marriott wedding planners to ensure every detail is perfect. Well-appointed guest rooms and suites feature featherbeds and luxurious linens, HD flat screen TVs with cable/satellite service, premium movie channels and pay-per-view options, as well as high speed Internet access and in-room coffee / tea service. The hotel also offers a concierge level for added amenities and concierge lounge access for complimentary food and non-alcoholic drinks. Accommodations for this relaxing Spa Escape for Two in Tampa, Florida may be booked online at http://www.marriott.com/hotels/travel/tpamc-tampa-marriott-waterside-hotel-and-marina/ by using promotional code SPA or by calling 1-800-228-9290 for reservations. *Rates are per room per night based on availability at the time of reservation and are valid for Thursday- Sunday stays through 4/30/11. Offer does not apply to groups of 10 or more rooms and may not be combined with any other discount or promotion. Please visit hotel website for complete terms and conditions. 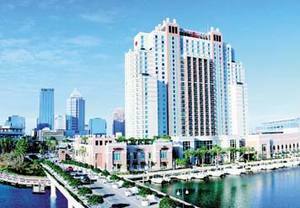 The Tampa Marriott Waterside Hotel & Marina is a world-class hotel property located in the heart of Downtown Tampa and beside the Tampa Convention Center, making it an excellent location for business travelers and event planners. With 50,000 square feet of newly renovated state-of-the-art event space, professional event managers and full-service catering, the hotel is an excellent choice for business conferences or corporate meetings. This magnificent property is also home to Spa Waterside, features a rooftop pool, four restaurants, a Starbucks Coffeehouse, Lobby Bar and a 32-slip full service marina. The Tampa Marriott Waterside rises from the central downtown district on a shimmering waterfront.